Fanned tails -- Introduction -- Skin spreaders -- Noise makers -- Inflators -- More about antlers -- Horns and antlers -- Color to attract, distract, or warn -- Fancy feathers -- Bird plumage -- Featherd show-offs -- Author's note -- More about animal show-offs. "With his signature breathtaking art, plus stunning gatefolds, acclaimed naturalist Jim Arnosky introduces children to the most eye-catching creatures in the animal kingdom! Meet the show-offs! 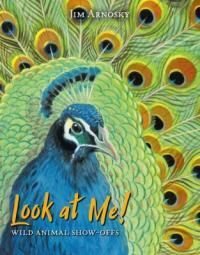 With their wacky eyebrows, beautiful patterns, and bright feathers and scales, many animals seem to be saying: "Look at ME!" That behavior certainly won't protect them from predators, so why do they do it? Jim Arnosky explores a multitude of creatures from across the globe to reveal the reasons behind their attention-grabbing behavior. His spectacular art, including amazing gatefolds, presents brilliantly colored poison arrow frogs of the rainforest; the breeding plumage of egrets and peacocks; the impressive antlers of deer and elk; the threatening hoods of cobras; the balloon-like displays of African bullfrogs; and the dramatic color transformation of spawning fish." -- ONIX annotation. Description: 31 pages : color illustrations ; 30 cm.